As its name suggests, Savute Elephant Lodge is known for the herds of elephants that can be spotted roaming its plains. But other large animals also gather here to slake their thirst, especially now that the intermittent Savute Channel has started flowing through Chobe National Park once again after an absence of nearly 30 years. 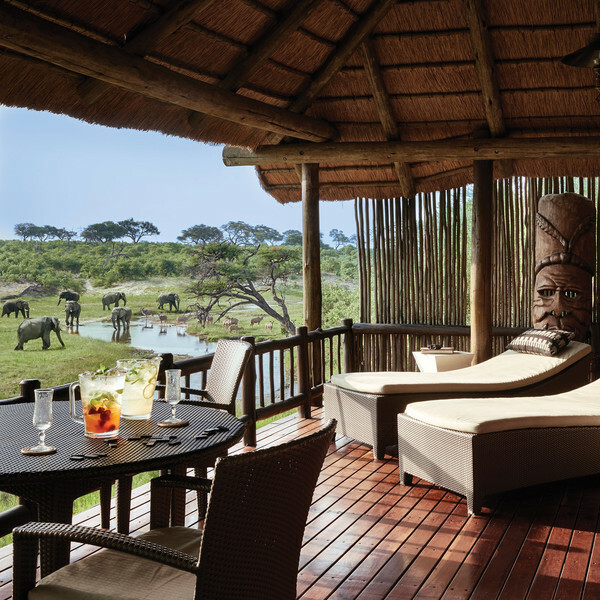 The camp has its own traditional boma, where guests can relax in the evening and swap safari experiences while marveling over the stars in the vast African night sky. This is a place to really feel the pulse of Botswana – and to become a part of it yourself. The 12 twin-bedded luxury canvas tents, recently placed under thatch, that are perfectly suited to the desert air feature lavishly appointed en-suite bathrooms and dressing areas. They also have private viewing decks and comfortable outdoor lounges overlooking the Channel. The tent interiors at Savute Elephant Lodge are luxuriously appointed with such comforts as an en suite bathroom, private fully stocked mini bar, four poster bed complete with mosquito netting, as well as air conditioning. You expect to see elephants here, but guests are still amazed when they see a dust cloud appear on the horizon that eventually turns into a thundering herd. The range of animals and birds here is outstanding. You can also see rare rock paintings drawn by San Bushmen, watch the sun set behind giant baobab trees.